"It’s no secret that replacing your notebook’s hard drive with a solid state disk can dramatically transform your computing experience. With even last year’s SSDs, tasks such as opening large files or starting bulky applications take mere moments to complete. And if you own a notebook powered by one of Intel’s 2nd Generation Core Series CPUs, you’re in for a whole new world of fast, courtesy of SATA III, a high-speed interface Intel included in its new chipsets starting in 2011." One of the secrets of enhancing computer performance is to remove bottlenecks, and a few years ago the biggest (and cheapest) way to gain added performance was to add memory. Today, memory seems to be no longer an issue, so we've moved on to the venerable hard drive as the point where data flow slows down. As SSD prices drop, expect to see the hard drive start to go the way of other past drives, and be replaced all or in part by solid state drives. We already are starting to see hybrid (multi-drive) systems, where the boot (OS and programs) drive is an SSD, and day-to-day data is still stored on a spinning drive. 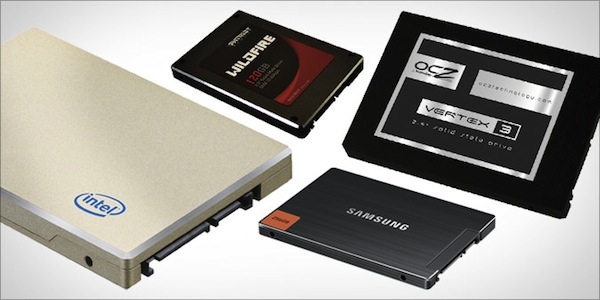 This review tests SATA III SSDs from Samsung, Intel, OCZ and Patriot, and they also do an interesting comparison on cost per gigabyte, ranging from $1.53 (OCZ 240GB) to $2.31 (Intel 120GB). Retail prices are expected to be lower. Their comparison hard drive was a 500GB 7,200rpm model, but at a significantly lower cost per GB. The tests are interesting, and the SSDs perform as expected, with Samsung's 830 winning the shootout (cost today $229 for 128GB and $429 for 256GB). Please note that these performance tests were done on laptops with Intel's current chipsets (supporting SATA III). Older systems will not see this performance.